Not a single one of these professors, who are capable of making very valuable contributions in the special fields of chemistry, history or physics, can be trusted one iota when it comes to philosophy. Why? For the same reason that not a single professor of political economy, who may be capable of very valuable contributions in the field of factual and specialised investigations, can be trusted one iota when it comes to the general theory of political economy. For in modern society the latter is as much a partisan science as is epistemology. Taken as a whole, the professors of economics are nothing but learned salesmen of the capitalist class, while the professors of philosophy are learned salesmen of the theologians. The task of Marxists in both cases is to be able to master and refashion the achievements of these “salesmen” (for instance, you will not make the slightest progress in the investigation of new economic phenomena without making use of the works of these salesmen) and to be able to lop off their reactionary tendency, to pursue our own line and to combat the whole line of the forces and classes hostile to us. And this is just what our Machists were unable to do; they slavishly follow the lead of the reactionary professorial philosophy. “Perhaps we have gone astray, but we are seeking,” wrote Lunacharsky in the name of the authors of the Studies. The trouble is that it is not you who are seeking, but you who are being sought! You do not go with your, i.e., Marxist (for you want to be Marxists), standpoint to every change in the bourgeois philosophical fashion; the fashion comes to you, foists upon you its new falsifications adapted to the idealist taste, one day à la Ostwald, the next day à la Mach, and the day after à la Poincaré. These silly “theoretical” devices (“energetics”, “elements”, “introjections”, etc.) in which you so naïvely believe are confined to a narrow and tiny school, while the ideological and social tendency of these devices is immediately spotted by the Wards, the neo-criticists, the immanentists, the Lopatins and the pragmatists, and it serves their purposes. The infatuation for empirio-criticism and “physical” idealism passes as rapidly as the infatuation for Neo-Kantianism and “physiological” idealism; but fideism takes advantage of every such infatuation and modifies its devices in a thousand ways for the benefit of philosophical idealism. 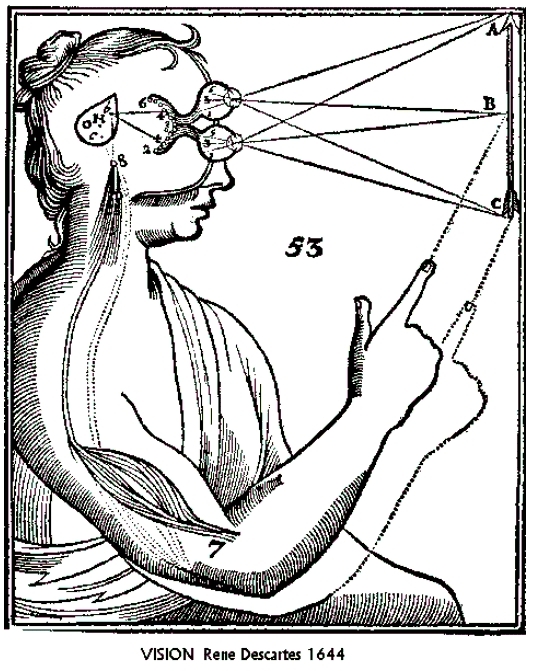 Woodcut from Descartes’ 1644 Principles of Philosophy illustrating his theory of vision. This entry was tagged 'physical' idealism, dialectical materialism, epistemology, Marxism, Materialism and Empirio-Criticism, objective reality, objective truth, philosophy, pineal gland, Principles of Philosophy, René Descartes, science, V.I.Lenin. Bookmark the permalink. I love the cartoon. Because it’s about how absurd it all is. As long as I keep seeing myself in the puddle, I know I’m real. But when I leave, where do I go if I’m not in the water anymore? How’s everything in your neck of the woods. It’s gotten cold here in San Miguel and these (stone) houses are NOT heated. By afternoon, it’s in the mid-70’s. Maybe that’s why I love Mexico. Like that cartoon, it just doesn’t make any sense! I’ve just been watching a series of NASA videos on the Orion project – fantastic! As I watched them I reflected on the vast difference in cultural spirit between the orientation required for that development and what is in Australia (and is getting worse). The Australian response would be ‘We don’t have the money’, ‘We’re only a middle power’ etc., but a love for learning and the new never starts with the problems. I remember Kennedy saying that the reason America would go to the moon is because of the difficulty (or words to that effect). Obviously competition with the Soviet Union was fundamental, but a drive for knowledge and the challenge of ‘new frontiers’ was certainly part of the motivation.